The corner reflector antenna is one of the many types of antennas that is fundamentally based on the standard dipole antenna, with one major difference. This antenna adds a reflecting corner to the dipole creating a directional antenna. This antenna often uses a dipole as the radiating element, however a folded dipole can also be used. The dipole is mounted in front of two flat rectangular metal pieces joined (or bent) at an angle, usually between 80° and 120°. A well designed corner reflector can have a peak gain between 8-15 dBi, and as such it is considered to have a directional pattern (click to rotate 3D image below) which is linearly polarized along the length of the dipole antenna. It is possible to obtain higher gain by adjusting the angle of the reflector, a more acute angle will be more directional while a more obtuse angle will be less directional. It is also possible to obtain elliptical and even circular polarization by rotating the dipole in respect to the corner reflector. The natural input impedance of a dipole antenna is 73Ω. However, when a reflector antenna is used the impedance will decrease as the size of the corner reflector is increased. The impedance will also vary with respect to the spacing between the corner and the dipole . 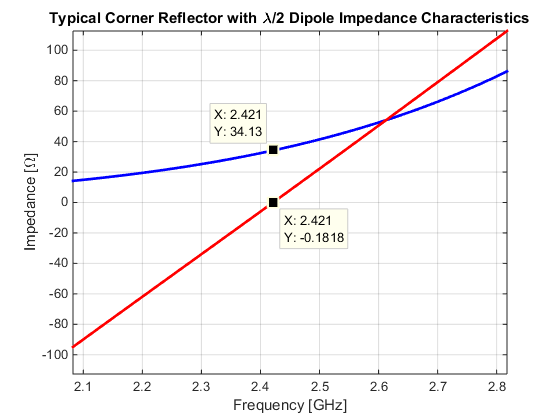 Below is the standard input impedance of a thin dipole antenna spaced a quarter wave from the center of a large corner reflector centered at 2.45GHz. As with the dipole antenna it is possible to increase the thickness of the dipole antenna to increase the bandwidth of the corner reflector. It is important to remember that because a dipole is a balanced structure, a balun should still be when feeding the dipole. 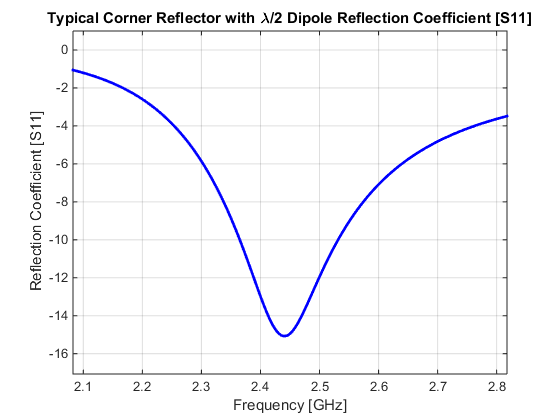 The 50Ω bandwidth of a 2.45GHz corner reflector antenna is shown below. Slightly more bandwidth is obtainable when balun is used to transform to the proper impedance (34Ω for this particular antenna). Decrease reflector angle to increase gain. Antenna, Antenna A-Z, Corner Reflector, Dipole. Bookmark. MicrowaveTools offers online tutorials, products, and design services. Our goal is to help educate individuals in microwave communication and detection.